Lifeline Ultra-2: the two coat application helps to ensure consistent color development on your walls. From the day that you apply it to the many years of durability that you get from it, this wood stain will distinguish your home. Samantha on 03/31/2019 - "I find this product to be one of the best on the market. It was my pleasure to do a maintenance coat on a log home in the heart of the Rocky Mountains. This maintenance was at least 2 to maybe 3 years overdue. Despite the length of time between the original finish to when I reapplied, there was minimal failure. When applied to the areas with the most intense exposure, i.e., handrails on a deck, they were brought back to life. Its coating is even, rich, and stands the test of time. Even in the harsh environment of Colorado." Lori on 02/10/2019 - "Easy to apply with sprayer and back brushing, even for inexperienced first-time log home owners like us. Easy to clean up with water. Pigment in stain hides some of the imperfections/staining in logs. Excellent customer support." Matt on 01/27/2019 - "Love the look and has lasted 5 years and still going!" Danielle on 11/03/2018 - "We had our house media blasted and restained with Perma-Chink System products this year and couldn't be happier. 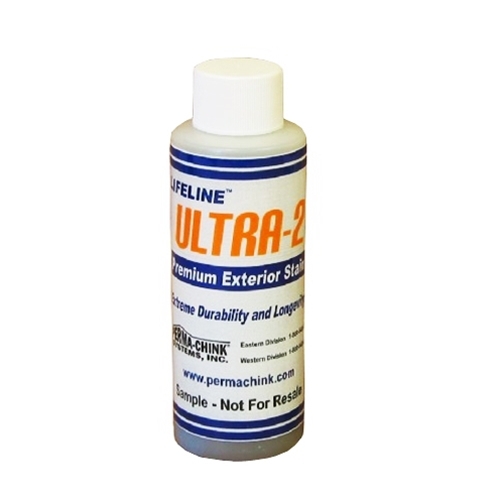 All of the products are top quality, but the Lifeline Ultra-2 stain is really at the top of it's class. We used the cedar color and it looks gorgeous. It's easy to apply and clean up is easy as well." Sarah on 11/02/2018 - "We used Lifeline Ultra-2, along with Log Wash and Shell Guard to prep and stain our log home. It went on so easily my husband and I were able to complete our whole house by ourselves. It's been finished now for 6 years and only this year did we add additional stain. 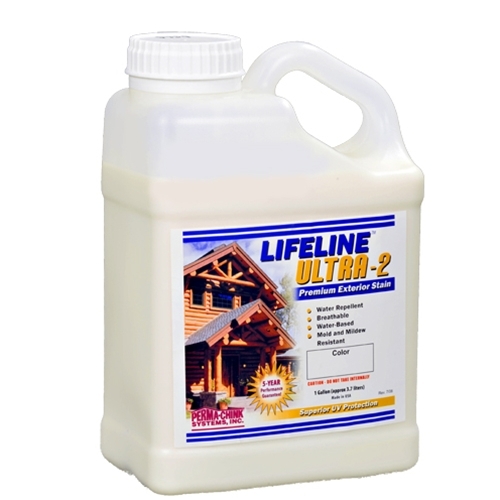 Lifeline Ultra-2 is like a protective seal around your logs. I even ended up staining my barn and chicken house with it!" Ronald H (07/01/2018) - "Customer loves the new Perma-Chink Lifeline Ultra-2 walnut stain - thank for another great product." Jack G (06/29/2018) - "Samples worked very well and helped us make a choice for refinishing our home. We have contracted with a specialist to do the work and will be purchasing the product. Thank you again"
Anjannette A (05/06/2018) - "Was looking for a spot to share my results of your product and wanted to express my satisfaction!! 100% Satisfied Customer!! Thank you Perma~Chink for bringing my Cabin back to life." Sondra G (10/30/2016) - "We used Ultra-2 (Bronze) and the Advance (Gloss) in 2011, and it still looks as good as it did in 2011! We do wash every year with the Log Wash. Perma-Chink always goes above and beyond to help the customer." Bob B (09/15/2016) - "I used a local “high performance” stain originally to coat my 5” cedar planks and it wore out in under a year. I stripped it off and then used Ultra-2. It’s been on there for three years and still looks great! Ultra-2 is a great product!" T Phillips (05/10/2016) - "We applied 2 coats of Ultra-2 Dark Natural & 1 coat of Advance Satin. Stir from the bottom up, thoroughly, just like directions read!! Very Important!! We also used Ultra-2 Walnut on our window trim for contrast." J Crawford (03/20/2016) - "I recently purchased a cabin in Utah and was interested in your Lifeline Ultra-2 finish. I decided to go with the Dark Honey. I love how the color looks on my cabin and the extra value of the U2 already having the UV boost in it. Thanks again for such a great product." K Flesher (03/16/2016) - "I used your entire system after blasting my home in 2008 and it is a lot easier to maintain than anything else I had used. Everyone, including contractors who stop by my property are asking what I used." S Dixon (08/15/2015) - "I like how Ultra2 is dry to the touch in 2-4 hours. Easy clean up and a 5 year warranty!" S Whitson (08/31/2015) - "I have been applying different products to log homes on a professional basis since 2006. Perma-Chink Systems has continually put out products that I believe in and will stand behind. Out of all the different stain manufacturers that I have used, Perma-Chink products are what I chose to apply to my log home(s) inside and out." T Woodward (07/21/2015) - "Ultra-2 is a wonderful product! Two coats of Ultra-2 and one coat of Advance (topcoat) make the house look brand new!" J C Enck (05/21/2015) - "The Ultra-2 it went on easy and the second coat made some blotchy areas even out, making them look great. The Advance (Gloss) top coat made it look even better!" R Flinchbaugh (03/03/2015) - "Even though the stain system seemed pricey at first, in the long run it was way cheaper. I stained about 6 years ago and it still looks great! I always recommend your product to everyone that asks what I used on my log home." R Andrews (11/08/2011) - "We removed the old finish on our home and applied the Ultra-2 and I cannot believe the night and day difference this has made with the appearance. The grains in the wood and the entire house just look beautiful." Bob G (10/03/2009) - "They originally used Superdeck stain which quickly deteriorated on their south side. We sanded all of our logs down to bare wood and applied 2 coats of Lifeline Ultra 2 and Lifeline Advance Satin. We love the outcome and have been happy ever since."